Author(s): Roberto Roiz-Santiañez, Unidad Investigación Psiquiatría, Hospital Universitario Marqués de Valdecilla, CIBERSAM, Avda. Valdecilla s/n, 39008, Santander, Spain. Paula Suarez-Pinilla, Benedicto Crespo-Facorro. The findings about the progressive brain changes in schizophrenia are controversial, and the potential confounding effect of antipsychotics on brain structure is still under debate. 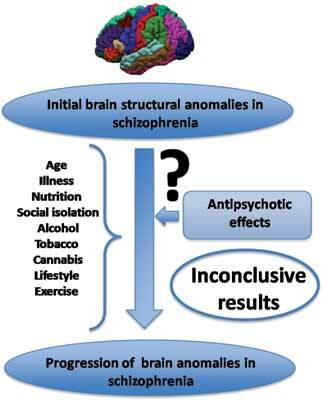 The goal of the current article was to review the existing longitudinal neuroimaging studies addressing the impact of antipsychotic drug treatment on brain changes in schizophrenia. A comprehensive search of PubMed was performed using combinations of key terms distributed into four blocks: “MRI”, “longitudinal”, “schizophrenia” and “antipsychotic”. Studies were considered to be eligible for the review if they were original articles. Studies that examined only changes in brain density were excluded. A total of 41 MRI studies were identified and reviewed. Longitudinal MRI studies did not provide a consistent notion of the effects of antipsychotic treatment on the pattern of brain changes over time in schizophrenia. Overall, most of the included articles did not find a linear relationship between the degree of exposure and progressive brain changes. Further short- and longterm studies are warranted to a better understanding of the influence of antipsychotics in brain structural changes in schizophrenia and also to verify whether first and second generation antipsychotics may differentially affect brain morphometry. Keywords: Antipsychotic, longitudinal studies, schizophrenia, structural magnetic resonance imaging. Affiliation:Unidad Investigación Psiquiatría, Hospital Universitario Marqués de Valdecilla, CIBERSAM, Avda. Valdecilla s/n, 39008, Santander, Spain. Keywords:Antipsychotic, longitudinal studies, schizophrenia, structural magnetic resonance imaging. Abstract:The findings about the progressive brain changes in schizophrenia are controversial, and the potential confounding effect of antipsychotics on brain structure is still under debate. The goal of the current article was to review the existing longitudinal neuroimaging studies addressing the impact of antipsychotic drug treatment on brain changes in schizophrenia. A comprehensive search of PubMed was performed using combinations of key terms distributed into four blocks: “MRI”, “longitudinal”, “schizophrenia” and “antipsychotic”. Studies were considered to be eligible for the review if they were original articles. Studies that examined only changes in brain density were excluded. A total of 41 MRI studies were identified and reviewed. Longitudinal MRI studies did not provide a consistent notion of the effects of antipsychotic treatment on the pattern of brain changes over time in schizophrenia. Overall, most of the included articles did not find a linear relationship between the degree of exposure and progressive brain changes. Further short- and longterm studies are warranted to a better understanding of the influence of antipsychotics in brain structural changes in schizophrenia and also to verify whether first and second generation antipsychotics may differentially affect brain morphometry. Sleep, Depression and Insomnia – A Vicious Circle?